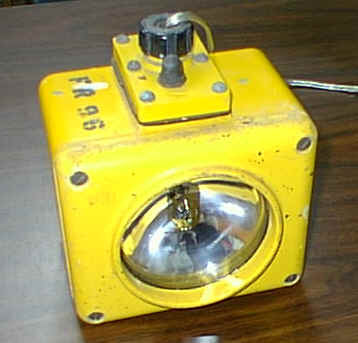 These deck lights have been overhauled after 50 years at sea. FANTASTIC for a deck, patio or dock. Keep them shined or allow them to tarnish to a salty green. Either way, they will provide you with dependable lighting for years. Measure 6" from the bulkhead, 10" long, 4 1/2" diameter base. Fixtures arrive cleaned with a light buffing and ready for installation. 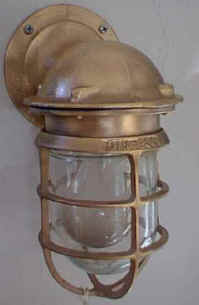 Price for each light $200.00. Bunk lights by Swivilier Co. 1967. The lamp pulls out and swivels in any direction. Small vent holes keep the bulb housing cool. Made in New York, Vessel was built at Sun Shipbuilding. Wired for 110 ac. Wonderful addition to your boat or den. Fair condition but a bargain at $30.00. I have about two dozen in stock. Battle lantern. Are you prepared for hurricane season? 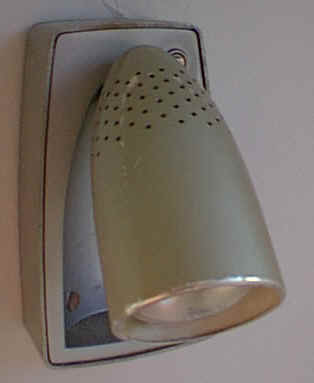 The two styles available are the contact type and the standard switch type. Contact type, shown to the left powers on automatically when your power goes out. Price $50.00. I will also begin selling parts to Coast Guard and Navy ships beginning 1 January 2007.